OpenSUSE  comes in two versions: one is Tumbleweed , which is a stable and fully tested rolling release distribution. Tumbleweed updates itself automatically, eliminating the need for reinstalls and upgrades seen in other regular Operating Systems. The second version of openSUSE is Leap . It's a very stable distribution that comes with fully tested, albeit a bit older, packages. openSUSE targets developers and maker communities. The openSUSE community has created many tools and projects that help developers build, package, test and distribute their product to a larger Linux community. Some of those projects included Open Build Service (OBS)  which helps developers automatically build packages and OpenQA , a fully automated package testing tool. At this year's SUSECon, SUSE announced SLES (SUSE Linux Enterprise Server) for Raspberry Pi 3. On the last day of the event, SUSE gave out Raspberry Pi 3s with a SUSE branded cases. This was due to the fact that openSUSE is also based on SLES, and a lot of work on Raspberry Pi was done by openSUSE community members. openSUSE is also now available for the Raspberry Pi 3. Although the OS cannot currently be installed via NOOBS, users can easily test openSUSE Leap 42.2. Note that only the Raspberry Pi 3, whichthat runs on ARMv8 architecture is currently supported. What's groundbreaking about this announcement is that this is the first 64-bit operating system for Raspberry Pi. While Raspberry Pi 3 itself is a 64-bit product, there have been no 64-bit operating systems for it until now. 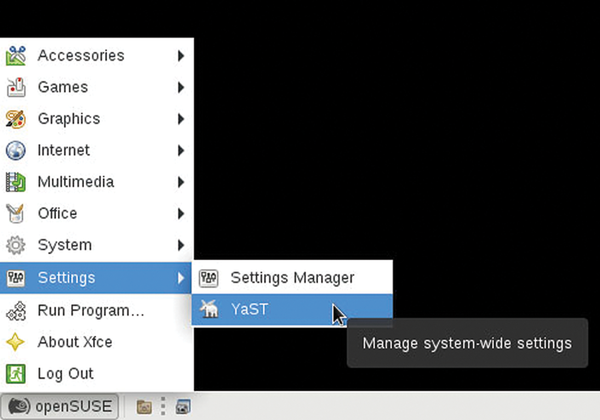 One popular tool on openSUSE is YaST (Yet another settings tool). YaST offers complete control over your Operating System from one place. Whether it is configuring the firewall, networking or software management, you will see how incredible and useful YaST is throughout this article. 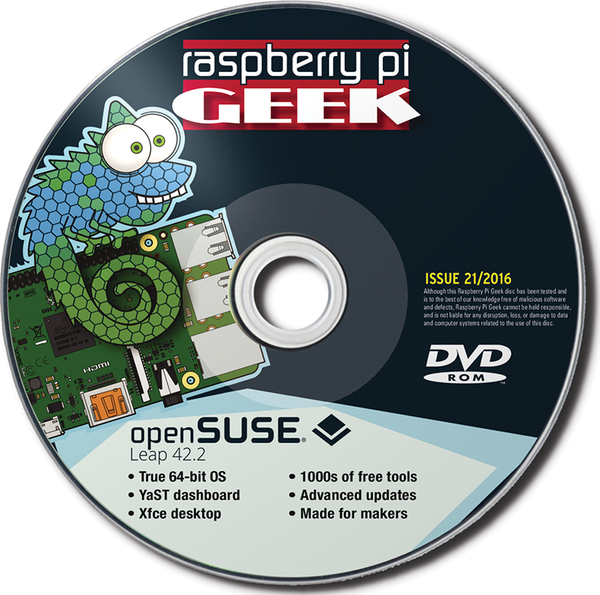 Start be installing openSUSE on your Raspberry Pi. You're going to install openSUSE Leap 42.2. You can use the DVD to copy over the raw image to your hard disk, or you can download the SHA256 checksum file and the image from the official website . If you use Linux, you can copy the image over to your SD card using the instruction shown in Listing 1. You must execute the instruction as root or using sudo. From Windows, you will a need a special tool, like Win32DiskImager  to copy the image over correctly. Congratulations! You have openSUSE Leap running on your Raspberry Pi. But wait! You must do a few things before you start using openSUSE (Figure 1). 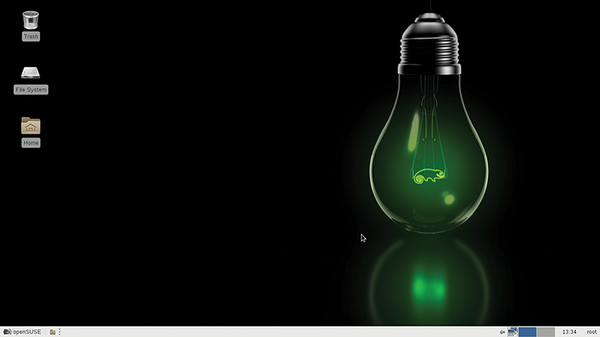 Figure 1: openSUSE's desktop right after installation. First of all, it's not safe to run your system as a root user, so you are going to create a non-privileged user for your system. This is where you meet YaST, the gem of the SUSE/openSUSE world. 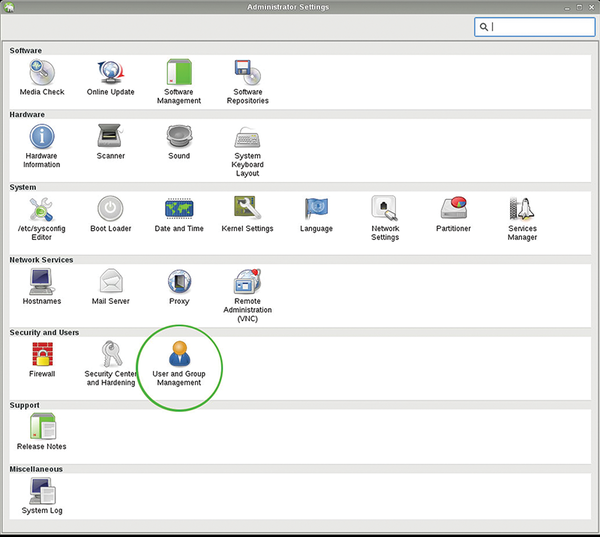 Open YaST from Start Menu > Settings > YaST (the Start Menu is located is the button with the openSUSE logo in the bottom left hand corner of your desktop – see Figure 1) and go to User and Group Management settings (Figure 2). You will notice that the User section is empty, as there are no regular users yet. Figure 2: Start YaST from Start Menu > Settings in the lower left corner of the screen. Click on the Add button at the bottom of the window and, in the next window, create a username and password for that user. Then click on the OK button, which will take you back to the previous window where you can see the name of the new user, click on OK again and it will take you back to the main YaST window. Never user default passwords on your systems, always change the password on your IoT devices as soon as you log on. To change the root password in openSUSE, go to User Management settings in YaST and, select System Users from the Set Filter drop down menu in the upper right hand corner of the window. Select root from the list and click on the Edit button at the bottom of the window. Now enter a new password in the next window and then click on OK. It will take you back to the previous windows, click OK again and it will store the changes. Now reboot your system and when it boots up, you can log in with the newly created users. Figure 3: YaST allows you to configure most aspects of your Pi, including adding users.